Experience a unique wine-tasting event in a multi-sensory space at the Cité du Vin and, for an hour and a half, plunge into a world of sights, sounds, tastes and scents. The first thing that beguiles the visitor is the images, a palette of colours unfurling on a 360° screen. Then the nose becomes more alert, perhaps the ears too. Voices get louder, crickets are ‘singing’. In front of each participant, a table mat on which you can note your impressions, a glass of water, a black glass and a spittoon. During the first projection in this multi-sense wine-tasting workshop , Eva, your guide, invites you to smell the wine you can’t see. There is no way you can be influenced by sight, which makes up half of our perception. It’s 11 o’clock, an ideal time for the tasting of wines. You don’t need to be a wine expert! This wine-tasting workshop awakens all the senses. Each peson says what they think they have tasted – and many are mistaken. But that doesn’t matter! 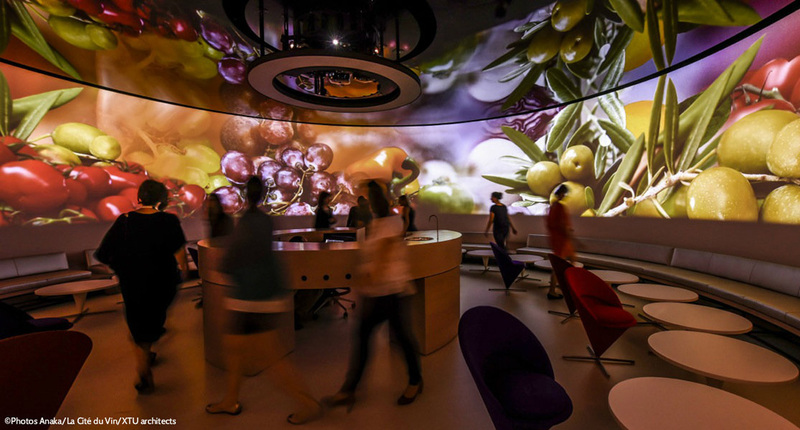 This immersive experience, lasting an hour and half, at the heart of the Cité du Vin in Bordeaux, aims to awaken the five senses. You don’t have to be a wine expert. In the second section, Eva reveals which wine was tasted – the particular type of wine changes depending on the day – as well as where and how it was made. A unique wine-tasting event that matches real wines with virtual foods..